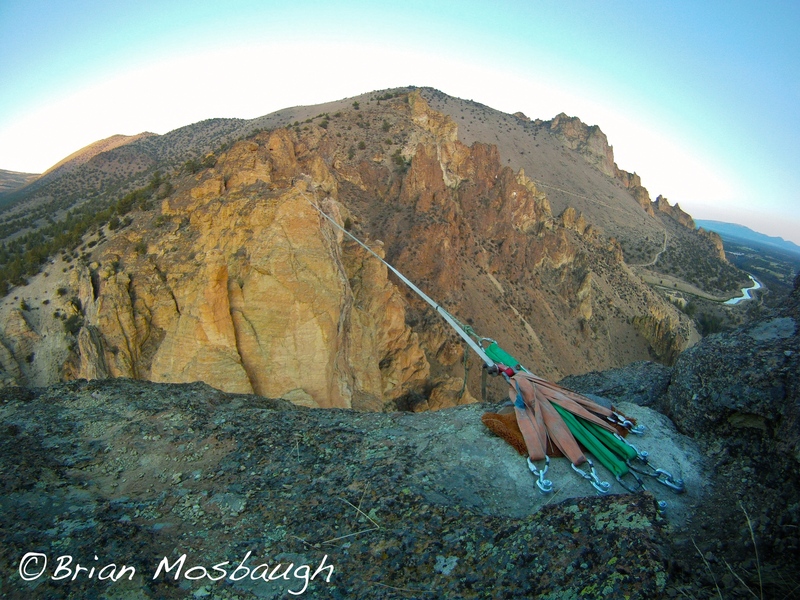 As the dirt slowly settled following the first annual Smith Rock Highline Festival, a handful of the local slackliners have teamed up with other visiting slackers to tackle some of the more serious highline projects which remained untapped after the gathering earlier this month. 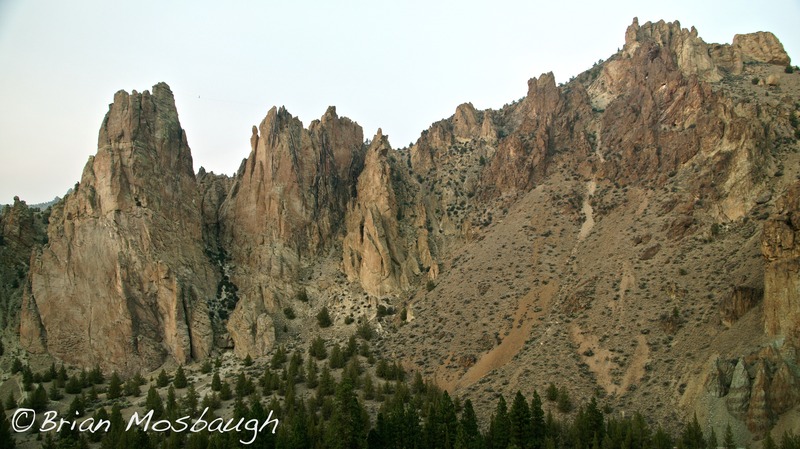 The most recent and impressive addition to the ticklist of accumulating highlines here at Smith Rock, and also marking the 18th line to be established to date, was rigged by Ethan Holt, Christian Krr and Brian Mosbaugh over the past week. It required two days of hauling heavy packs along rocky ridge lines to the summits of The Monument and Anglin’s Tower and entailed many hours of hiking in 90 degree heat during the day and leaving by headlamp at night, hoping not to aggravate the lurking rattle snakes and scorpions in route to camp. This rigging mission also demanded a lot of loose rock scrambling and hauling heavy packs up vertical rock faces, as part of the many challenges confronted leading up to a finally successful experience. When all was said and done constructing this monster of a line, it required close to 1,000′ of climbing rope to get the initial guide line across the gap in order to ferry the 300′ of slackline and backup materials across to their respective anchors. 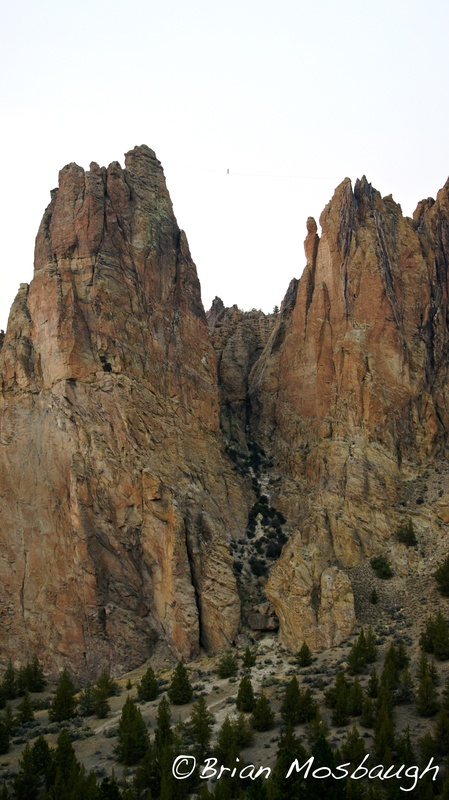 The Monument has stood out for a long time as an obvious spot for an impressive highline, but it wasn’t until Christian’s infectious enthusiasm to take on bigger challenges hit the Smith Rock scene that we all mustered the energy needed to see it through, allowing for another slackline dream to manifest into reality. “The two towers were some of the first I saw here,” Christian commented shortly after arriving to the park for the first time, “and I thought, WOW, between those towers there must be a line.” “When I finally reached them it was like this big gate was open, it was perfect! The next challenge was how to reach the summits and get the line across, and in the end somehow it all worked out,” he explained after establishing the first walk of the line and entitling it Temple of the Wind. Christian is based out of Berlin, Germany and is once again on another highlining road trip across the United States hoping to leave his mark and test his balance one step at a time. Over all, Temple of the Wind weighs in at an impressive and intimidating 230′ of length with 450′ of dizzying vertical exposure below which pulls at the very depths of the human psyche. As made obvious by the lines title, the gusting wind is unrelenting through this corridor of rock towers so good luck waiting for any calm external conditions in this location. When attempting to successfully walk a line of this caliber, Christian reveals that, “I just stare at one point near the anchor, basically giving my mind something easy to do. I try not to think about walking, since the body totally knows what to do after walking so many slacklines. I just let my reactions take over and focus on my breathing,” he explains. When asked about any final or lasting impressions he had concerning the new line, he mentioned a specific quote that kept going through his mind after seeing the photos and scale of his performance, “I am just a speck of dust inside a giant’s eye.” This seems to be one of the universal impressions which highlining so readily offers to those who practice it. The perspective of being so high above an abyss, and witnessing first hand the larger scale of our small presence, is ironically a very “grounding” reminder to tread carefully with meaning in a world that is much larger than any one of us… Christian will go for the full-man walk today as a couple of other contenders will put their balanced minds and bodies to test against this new Smith Rock test piece.